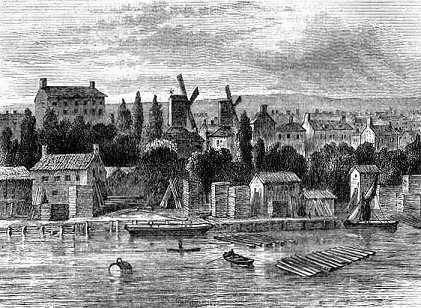 There were three windmills in the vicinity of Lambeth Walk. They were much used by the market gardens which helped to swell the food supplies for the ever-growing population north of the Thames in the 18th and early 19th centuries. Some of this food was grown in a market garden held by one Simon Harding who had a cottage and smallholding of three acres in Walnut Tree Walk. Looking at it today, it stretches the imagination to see it as a lane leading into Three Coney Walk and thence into the fields. Ducarel tells us that by 1785 Three Coney Walk was by then generally called Lambeth Walk, a name lately given by the builders of several new houses there. The most northerly windmill was in a field to the west of the Walk and north of Paradise Row. It was approached by means of a lane which later became known as Mill Street (now Juxon Street, after William Juxon, an Archbishop of Canterbury in the 1660s). The first evidence of the mill’s existence is a drawing by Bernard Lens in 1735 entitled “a view of the Palace of Lambeth” which shows the mill standing before the palace as seen from the river. Apparently it was a tower mill with four sails. It also appeared in Rocque’s survey of 1741-5 and in later maps including one of 1767. The first name connected with the mill is from a rate book of 1770, where Thomas Corner is charged 15s (15 shillings – 75p) on a rateable value of £30. In 1809, we know that John Fleet became the miller; the London Gazette of 3 August 1811 referred to him as being in bankruptcy. After that the mill was taken over by Mr B Holden who occupied it until 1820. A watercolour by H Pyall of 1820 shows the mill as a seven-storey tower, being circular and stone built, with an upper ten-sided portion of wood. There were four common sails with furled canvas and a semispherical cap. By this date, the mill appears hemmed in by small houses on all sides, although only eight years previously, in 1812, a map by WES Driver showed the area to the south of Mill Street as open ground. The census of 1841 mentions several millers living in the area, but whether they worked in the mill is not certain. There was Thomas Vine aged 40, miller, who lived with his family in Mill Street, David Knight aged 25 and his wife who lived in Windmill Street which was approximately on the site of the present day Sail Street, and John Athill aged 30, miller, living in Lambeth Walk. The mill was still shown on maps in its later years; the last one on which it appears is that of Crutchley dated 1841, which also shows the route of the railway line extension, then under construction from Nine Elms to York Road, Waterloo, passing close to the west of the mill site. It was undoubtedly this which led to demolition. No further maps or documents mention the mill. The railway extension opened on 11 July 1848. but the 1851 census shows Z. Blavean, shoemaker, still carrying on his trade in the mill yard in Mill Street.